Nothing can be greener than this. A tote bag made out of actual billboard material! Taken while walking through Times Square with my sisters and Berry last month! It's a limited edition piece, made out of tarp from the New York City 42nd and Broadway billboards and thus, no two will be alike. So if you want a piece of the Liberty of London x Target action and a piece of NYC, this is what you should go for! Hey, $29.99 for a limited edition tote is not a bad deal at all! Pre-order now before this goes out of stock! The bags are due to ship out starting September 5, 2010. Oh! And hey, since we have a lot of billboards in Manila, maybe this is a good way to recycle old billboard ads no? That is, if the tarps haven't been worn out by wind, water and pollution already. But hey, a Vicki Belo Billboard tote sounds so kitschy bad, it's so good! I want one! 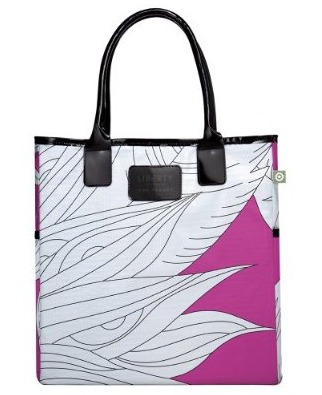 Note: Each Liberty of London x Target Billboard bag is unique in color and pattern based on the variance in billboard material used to manufacture it (see first photo to get an idea of what prints to expect).